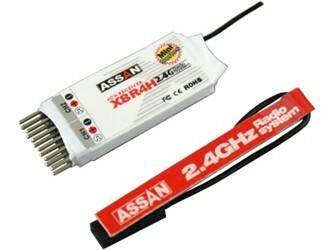 The Assan X8-R4H 2.4Ghz 4-Channel Micro Receiver is your key to hassle-free 2.4 Spread Spectrum! The X8-R4H will bind (link) securely in seconds to any X8 transmitter module. You can bind as many X8 receivers as you'd like to your transmit module, so you can enjoy the worry-free benefits of 2.4 Ghz. And at these incredible prices, now you can convert your whole fleet to 2.4 Ghz and finally enjoy the peace-of-mind of Spread Spectrum! View our Assan FAQ page for more information about the X8 system. -No interference from motors, ignitions or metal to metal friction. -No need to change any settings on your radio or program a new radio. -Works with all X8 systems.